Processing: Images were captured Artemis Capture (as FITs). Aligned/stacked and dark subtracted in Astroart with Sigma Combine. Luminance and Color channels were scaled and rough color balanced in Astroart. All combined stacks were up-sampled to 1392x1040 (1x1 bin resolution). Central Gradient was removed on all channels in Astroart. Channels were co-registered in Astroart. The 6 minute IR block exposures were used for the main luminance construction with level adjustments and curves to bring out object features. LRGB combine was done in Photoshop. Background noise reduction was done with PixInsight LE (SGBNR). Selective sharpening was applied to galaxy features. Final Image size is approximately 1392x1040. This image was guided; North is to the left. 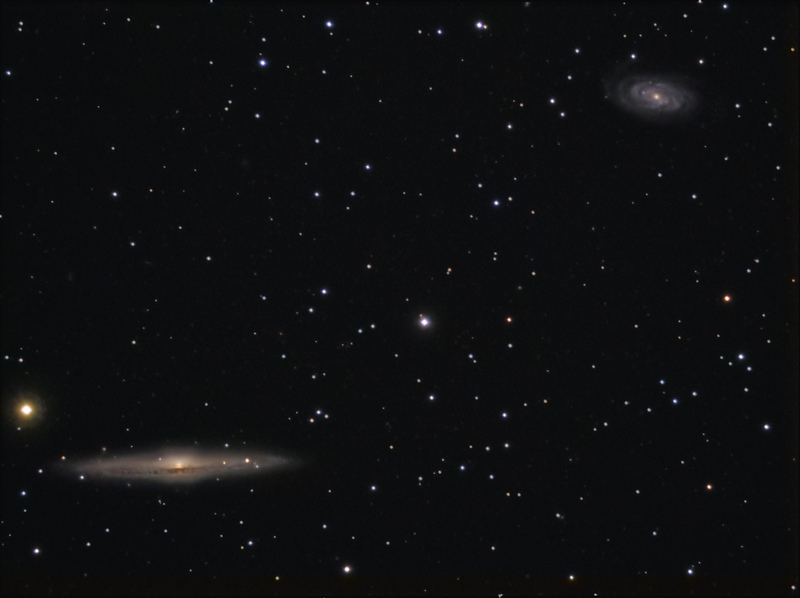 In this image, the two galaxies are NGC 5746 (in the lower left) and NGC 5740 (in the upper right). These galaxies are in the constellation of Virgo NGC 5746 is estimated to be about 95 million light years distant from Earth. Horizontal FOV is 29'. Image Center is approximately - Equatorial 2000: RA: 14h 44m 45s Dec: +01°49'07"